We are pleased to announce that Michael A. Delgado has joined Rhinebeck Bank as a Residential Mortgage Lender. Delgado has held a real estate broker’s license for 35 years, and has been in the mortgage industry originating loans for 15 years. His previous positions were held at Valley National Bank and the Hudson Valley Federal Credit Union. Delgado will be assisting residential mortgage customers in Orange County from the Bank’s 252 Main Street, Goshen branch location and representative offices at 2134 State Route 208 Montgomery, NY 12549. Delgado received his Bachelor’s Degree and PhD from Fordham University, completed his post-graduate studies at Britain’s Christ Church Oxford University and achieved his Doctoral Completion Graduate Theological, completed in South Bend, IN. With an emphasis on great communication and a high level of service to all of his clients, Delgado’s dedication to his job is what has been his key to success. He holds National Association of Realtors Certified Residential Specialist (CRS) and Graduate REALTOR® Institute (GRI) designations. Delgado is bilingual, speaking both English and Spanish, and is an approved NYS Licensed Technical Instructor for Realtors. He lived with Lakota elders and as part of his doctoral studies, he counseled youth for 10 years on the Rosebud and Pine Ridge Reservations. Rhinebeck Bank is pleased to announce their next local artist is now on display in its Rhinebeck branch: painter Kasmira Demyan. Growing up, Demyan was a creative child, as her mother always stressed the importance of art and to follow any passion she had. She studied visual arts at SUNY Ulster and then transferred to the University at Albany to pursue her interest in Psychology. In December 2018, Demyan graduated with her Bachelor’s Degree in Psychology and is currently pursuing her career as an artist while researching graduate school for art therapy. Her work has been displayed in numerous art shows and juried exhibits across the Hudson Valley, including the Saratoga Arts "120* Intercollegiate Regional" and the Peace Nation Café’s "Abstractions & Illustrations" exhibition in Kingston, N.Y, to name a few. Demyan’s s work lies within the realm of traditional art styles and contemporary abstraction. She lets her creative energy flow onto a canvas, creating a confessional of her thoughts and emotions. As an artist and aspiring art therapist, Demyan wants to help inspire the creative process for individuals who endure physical, mental, and/or emotional wounds to create metaphors and visual symbols to awaken their subconscious mind to allow an unspoken dialogue to be revealed. She resonates to art as "An engagement for a moment of relief and connection. A paradox between nature and a visual study. The assemblages in my process of work reveal a deeper connection to our surroundings and a disconnect from ourselves." Demyan's exhibit, "Growth of the Soul" will be on display until May 30th. To view more work or for inquiries, please contact Kasmirademyan.portfoliobox.me. The Artwork Program at Rhinebeck Bank is aimed at showcasing local artists by giving them a convenient way to gain exposure for their creations. Rhinebeck Bank is always happy to hear from additional artists who would like to show their art, and will work with them to schedule a viewing period in one of their branches. Interested parties can contact the Bank via e-mail at Artwork@RhinebeckBank.com. Please submit a sample of your work and which location, Beacon or Rhinebeck, you are interested in having host your artwork. There is no cost to participate in the Artwork Program and Rhinebeck Bank does not receive any commission on works sold as a result of the exhibit. Zelle® Now Live in the Rhinebeck Bank Mobile Banking App! Rhinebeck Bank announced today that the Zelle experience is now LIVE in their mobile banking app. Embedded into the digital banking experience of Rhinebeck Bank, Zelle enables convenient person-to-person (P2P) payments for the Bank’s more than 3,000 mobile banking consumers. Zelle makes it fast, safe and easy to send money to people in your life who you know and trust. “We strive to meet and exceed the needs of today’s on-the-go banking customer. By adding Zelle® to our already robust suite of banking technology— Rhinebeck Bank mobile app, SecurLOCK™ Equip app and Touch ID®--we are giving our customers something they will certainly appreciate,” said Jamie Bloom, Chief Operating Officer at Rhinebeck Bank. Rhinebeck Bank knows how important convenience is in today’s digital world and that is why we do all we can to stay ahead on all of the e-banking and mobile banking options available to our customers. Brought to you by Early Warning Services, LLC, an innovator in payment and risk management solutions, Zelle makes it fast, safe and easy for money to move. The Zelle Network® connects the nation’s leading financial institutions, enabling consumers to send fast person-to-person payments to nearly anyone with a bank account in the U.S. Funds are available directly in consumer bank accounts generally within minutes when the recipient is already enrolled with Zelle. To learn more about Zelle and its participating financial institutions, visit http://www.zellepay.com. [i] Transactions typically occur within minutes when the recipient's email address or U.S mobile number is already enrolled with Zelle. Michael J. Quinn, President & CEO of Rhinebeck Bank said: "improving cities in the Hudson Valley cannot be left to government alone. Rhinebeck Bank is proud to collaborate with the City and all of its stakeholders at such an exciting time in the City’s history. Our intent is to be one part of the effort to restore vibrancy and support smart growth in the City’s downtown core. Funding is a major factor in community growth and we're proud to provide a key source for future business expansion in the city. If you're a business in the Poughkeepsie Innovation District and need funding, please call us to explore possible financing opportunities. Our loan officers are available to provide advice and expertise to help applicants put together their loan application and supporting documentation necessary to be considered for approval under this program." Rhinebeck Bank Announces New Artists on Display: Bentley Potter and Prudence Haze. Rhinebeck Bank has always had a passion for supporting the arts. There is gallery space available for artists at the Bank's Beacon and Rhinebeck branches to display and/or sell their artwork. Bentley Potter's photography will be displayed in the Rhinebeck Branch until April 1st. As a life long resident of the Kingston area, the inspiration for his work has been derived from locations here in the Hudson Valley. With a primary focus on landscapes of our historic region, Potter also enjoys capturing various types of real estate properties as part of his collections. Potter is the founder of "Lost Pets of the Hudson Valley," which is dedicated to finding missing pets and reuniting them with their respective families. Potter's accomplishments include four opening receptions throughout the Hudson Valley and mural displays located in the Hudson Valley Mall. For purchasing information and other inquires on Bentley Potter's work please visit: facebook.com/bentleypotterphotography. Prudence Haze will be returning to Rhinebeck Bank’s Beacon branch. This exhibit is truly a blast from the past with a twist. Apart from Prudence's usual style of work, she is now incorporating her life long love for 60s/70s pop culture, music and fashion into her artwork. "Love" will be Prudence's first exhibit to showcase her retro style of work. Currently based in Saugerties, New York, Prudence is a self-taught artist who has had artwork exhibited at various art shows and galleries. She has also painted live at events and festivals. Prudence plans to continue to test and challenge the boundaries though artistic expression with her very unique colorful style. She hopes to inspire and reach as many people and artists that she can along her journey. For all purchasing and inquiries please email: prudence.haze@yahoo.com. Rhinebeck Bancorp, Inc. (the “Company”), the holding company for Rhinebeck Bank, announced today that it had closed its stock offering in connection with the completion of the reorganization of Rhinebeck Bank and Rhinebeck Bancorp, MHC into the two-tier mutual holding company form of organization. The Company sold 4,787,315 shares of common stock at a price of $10.00 per share in its subscription offering, including 436,425 shares sold to Rhinebeck Bank’s employee stock ownership plan. Upon closing, 11,133,290 shares of the Company’s common stock are outstanding, including 6,345,975 shares issued to Rhinebeck Bancorp, MHC. Persons wishing to confirm their stock allocations may contact the Stock Information Center at (845) 763-4733, which will be open for this purpose from 10:00 a.m. to 4:00 p.m., Eastern Time. Shares of the Company’s common stock are expected to begin trading on January 17, 2019 on the Nasdaq Capital Market under the trading symbol “RBKB.” The Company’s transfer agent, Continental Stock Transfer & Trust Company, expects to mail Direct Registration Statements reflecting the shares purchased in the stock offering, a check for any interest due on funds submitted and, if any subscription was not filled in full, any refund due on or about January 17, 2019. Sandler O’Neill & Partners, L.P. acted as marketing agent for the Company in connection with the stock offering. Luse Gorman, PC acted as legal counsel to the Company and Rhinebeck Bank. Silver, Freedman, Taff & Tiernan LLP acted as legal counsel to Sandler O’Neill & Partners, L.P. This press release contains forward-looking statements about the offering. Forward-looking statements include statements regarding anticipated future events and can be identified by the fact that they do not relate strictly to historical or current facts. They often include words such as “believe,” “expect,” “anticipate,” “estimate,” and “intend” or future or conditional verbs such as “will,” “would,” “should,” “could,” or “may.” Forward-looking statements, by their nature, are subject to risks and uncertainties. Certain factors that could cause actual results to differ materially from expected results include delays in consummation of the offering, increased competitive pressures, changes in the interest rate environment, general economic conditions or conditions within the securities markets, and legislative and regulatory changes that could adversely affect the business in which the Bank is engaged. Rhinebeck Bancorp, Inc. (the “Company”), the holding company for Rhinebeck Bank, announced today that the Company has received all regulatory approvals required for the completion of the Company’s minority stock offering, and expects to close the offering on January 16, 2019. Shares of the Company’s common stock are expected to begin trading on January 17, 2019 on the Nasdaq Capital Market under the trading symbol “RBKB.” Following the closing of the offering, Rhinebeck Bank will become the wholly-owned subsidiary of the Company, and the Company will become the majority-owned subsidiary of Rhinebeck Bancorp, MHC. A total of 4,787,315 shares of the Company’s common stock are expected to be sold in the offering at a price of $10.00 per share. The offering was oversubscribed by eligible depositors of the Bank having a first-tier priority under the Company’s Plan of Reorganization and Minority Stock Issuance (i.e., depositors with a qualifying deposit as of December 31, 2016). Accordingly, shares will be allocated to valid orders received from those depositors in accordance with the terms of the Plan of Reorganization, as described in the Company’s Prospectus. In accordance with the Plan, the Company’s employee stock ownership plan will purchase 436,425 shares in the offering, which shares are included in the 4,787,315 shares of common stock expected to be sold in the offering. Any other orders received in the subscription offering will not be filled. Persons wishing to confirm their stock allocations may contact the Stock Information Center at (845) 763-4733, which will be open for this purpose from 10:00 a.m. to 4:00 p.m., Eastern Time, beginning on Tuesday, January 15, 2019. In accordance with the terms of the Plan of Reorganization, the Company will also issue 6,345,975 shares of its common stock to Rhinebeck Bancorp, MHC, the Company’s mutual holding company. A total of 11,133,290 shares of common stock will be outstanding following the completion of the offering. The Company’s transfer agent, Continental Stock Transfer & Trust Company, expects to mail Direct Registration Statements reflecting the shares purchased in the stock offering, a check for any interest due on funds submitted and, if any subscription was not filled in full, any refund due on or about January 17, 2019. A registration statement relating to these securities has been filed with the United States Securities and Exchange Commission. This press release is neither an offer to sell nor a solicitation of an offer to buy common stock. The offer will be made only by means of the written prospectus forming part of the registration statement. Rhinebeck Bancorp, Inc. (the “Company”) announced that the depositors of Rhinebeck Bank (the “Bank”) approved the plan of reorganization and minority stock issuance pursuant to which the Bank will reorganize into the two-tier mutual holding company structure. As part of the reorganization and stock offering, the Bank will become the wholly-owned subsidiary of the Company and the Company will issue 43% of its shares of common stock to eligible depositors and the remaining shares will be issued to Rhinebeck Bancorp, MHC. The Company also announced that the vote to establish and fund a charitable foundation in connection with the reorganization did not receive the requisite vote. The Company plans to complete the reorganization and stock offering without the establishment of the charitable foundation. In addition, the Company announced that in the subscription offering that closed on December 13, 2018, the Company received orders in excess of the adjusted maximum of the offering range (4,787,315 shares). The number of shares to be sold in connection with the stock offering will be based on a final appraisal and receipt of final regulatory approvals. The Company is currently processing orders and will provide further information as soon as it is available. Rhinebeck Bank has served the banking needs of its customers in the central Hudson Valley region of New York State since 1860. It operates from its executive offices/headquarters in Poughkeepsie, New York and 11 branch offices located in Dutchess, Orange and Ulster Counties, New York. At September 30, 2018, the Bank (and its parent Rhinebeck Bancorp, MHC) had consolidated total assets of $819.7 million, total deposits of $691.7 million and total equity of $57.0 million. This press release contains forward-looking statements about the offering. Forward-looking statements include statements regarding anticipated future events and can be identified by the fact that they do not relate strictly to historical or current facts. They often include words such as “believe,” “expect,” “anticipate,” “estimate,” and “intend” or future or conditional verbs such as “will,” “would,” “should,” “could,” or “may.” Forward-looking statements, by their nature, are subject to risks and uncertainties. Certain factors that could cause actual results to differ materially from expected results include delays in consummation of the offering, delays in receiving final regulatory approvals, increased competitive pressures, changes in the interest rate environment, general economic conditions or conditions within the securities markets, and legislative and regulatory changes that could adversely affect the business in which the Bank is engaged. Rhinebeck Bank is excited to announce that Alexandra Martinez has recently been promoted to Assistant Vice President, Operations Manager at their Poughkeepsie headquarters. Before starting her career in banking in 2006 with the Hudson Valley Federal Credit Union, Martinez attended various institutions for her degrees. She originally attended Manhattan College for Communications, but later transferred to Dutchess Community College to attain her Associates Degree. From there, she continued her education earning a Bachelor of Science degree in Organizational Leadership and Communications from Marist College. Additionally, she has completed some graduate level courses. Martinez is married, a mother of 2 young children, and also has an English Springer Spaniel dog. She enjoys musical theatre and loves to sing. For 158 years, Rhinebeck Bank has been an integral part of the economic growth and a driving force for commerce along the Hudson River. Over the years they have remained local, with their headquarters in Dutchess County. Rhinebeck Bank prides themselves in being personally involved in the business communities and charitable organizations. Their ability to be responsive to the needs of their customers and community has ensured their continued growth. All decisions, policies and loan approvals are made locally by people who live and work in the area. For more information about Rhinebeck Bank or any of their products or services please visit: www.RhinebeckBank.com. Warner Construction Makes Debut on Wake Up with Rhinebeck Bank! Using his 20+ years of experience in construction, Warner brings the building and rebuilding of both commercial and residential projects to the Hudson Valley area. In this episode, learn about Warner’s many projects, where the business began, and how and why he leads his company in a style similar to coaching a football team. With a passion for construction, Warner has been involved with building over 800 homes throughout his career. Warner Construction is also known for their frequent commercial work throughout the tri-state area, including various remodels of popular gas stations and Dunkin Donuts® franchises. When asked about Rhinebeck Bank’s contribution to Warner Construction Inc.’s success, Warner explains that once the company reached a level where they needed bank partnership to grow, “Rhinebeck Bank looked at me as a person, my philosophies, and my business model. They didn’t look at me as just a number.” To watch the full episode, click here. Wake Up with Rhinebeck Bank is the Hudson Valley’s online TV talk show whose goal is to highlight local businesses, historical sites, and leaders of this strong community. Host Michelle Barone-Lepore interviews guests to showcase happenings and topics of interest to locals to learn a more personable side of guests, their organizations, and their plans for the future. Watch the show every Monday morning to learn more! Rhinebeck Bank has been an integral part of the community since 1860. It is committed to remaining a local, independent bank; helping people and businesses flourish in the Hudson Valley. For more information about Rhinebeck Bank or any of their products or services, please visit them at www.RhinebeckBank.com. Beacon Historical Society Makes Debut on Wake Up with Rhinebeck Bank! True to their mission to preserve, procure, and present Beacon’s heritage and history alive, the Beacon Historical Society has kept the city’s history alive and accessible to area residents for over 42 years. On this episode, learn about how the Beacon Historical Society was founded, their historic tours, and some of Beacon’s most compelling stories. Through the endless donations of historic photographs, business ledgers, maps and artifacts, the Beacon Historical Society has grown tremendously from its start as a room in the Holland Center. Today, the Society’s collection contains over 5,000 different historical items. Through various tours of distinctive parts of history, both Lucas and Murnane bring historical figures to life to show the story of those inhabited Beacon. “There is a reason the word ‘story’ is in history”, stated Murnane, referring to the Society’s storytelling approach to educating the community. Known as one of the first European landowners and business woman to the area, Murnane portrays Catherine Rombout, who inherited 85,000 acres of land from her father, Francis Rombout, in the late 1600s. Other tours the Society conducts include their ghost tours and postcard tours. When asked about Rhinebeck Bank’s contribution to the Beacon Historical Society’s success, Lucas explains how important it is to be able to know your banker and have them be accessible. She further explains how the Bank’s help and advice continues to the aid the Society through their growing process. Watch the episode here to learn more about the Beacon Historical Society. Wake Up with Rhinebeck Bank is the Hudson Valley’s online TV talk show with the goal of highlighting local businesses, historical sites, and leaders of this strong community. Host Michelle Barone-Lepore interviews guests to showcase happenings and topics of interest to locals to learn a more personable side of guests, their organizations, and their plans for the future. Watch the show every Monday morning to learn more! Rhinebeck Bank has been an integral part of the community since 1860. It is committed to remaining a local, independent bank; helping people and businesses flourish in the Hudson Valley. For more information about Rhinebeck Bank or any of their products or services, please visit: www.RhinebeckBank.com. Rhinebeck Bank is pleased to announce another local artist who is now on display in its Beacon branch: photographer Leslie Sternlieb. A Florida native, Sternlieb turned her camera to the Hudson Valley after moving to the area almost two years ago. Though her passion is photography, professionally she has worked as a writer and editor for museum and educational publications at The Wolfsonian-Florida International University. Previously, Sternlieb worked as a magazine editor and in media relations for various performing arts organizations. Her featured photography collection was taken during the Winnakee Land Trust's 2017 Tour of Historic Barns and Working Farms as a part of her ongoing discovery of the area's treasures. In honor of that, Sternlieb has chosen to donate proceeds from the sale of images within this collection to the Winnakee Land Trust, whose mission is to preserve our natural and agricultural resources and provide recreation opportunities in the community. Sally Mazzarella, Winnakee Land Trust President Emeritus, shared her thoughts, "We are so pleased that Rhinebeck Bank will be showcasing the beautiful photography of Leslie Sternlieb; both the bank and Leslie are wonderful supporters of the Winnakee Land Trust mission. This collection, which Leslie captured during Winnakee's Annual Tour of Historic Barns and Working Farms in 2017, truly reflects the rich history of our region. We encourage everyone to go see the exhibit at Rhinebeck Bank's Beacon branch; it's a great reminder of why we do what we do to protect our area's unique legacy." Sternlieb's artwork will be on display at the branch until January 21st. Stop in during business hours to enjoy this captivating photo exhibit! The Artwork Program at Rhinebeck Bank is aimed at showcasing local artists by giving them a convenient way to gain exposure for their creations.. Rhinebeck Bank is always happy to hear from additional artists who would like to show their art, and will work with them to schedule a viewing period in one of their branches. Interested parties can contact the Bank via e-mail at Artwork@RhinebeckBank.com. Please submit a sample of your work and which location, Beacon or Rhinebeck, you are interested in having host your artwork. There is no cost to participate in the Artwork Program and Rhinebeck Bank does not receive any commission on works sold as a result of the exhibit..
Rhinebeck Bank has been an integral part of the community since 1860. They are committed to remaining a local, independent bank focused on helping people and businesses flourish in the Hudson Valley. For more information about Rhinebeck Bank or any of their products or services please visit: www.RhinebeckBank.com. Learn about our Artwork Program on Wake Up with Rhinebeck Bank! Beginning in 2017, the Artwork Program at Rhinebeck Bank has showcased local artists by giving them a convenient way to reach viewers, get publicity, and sell their works. On this episode, learn about photographer Harvey L. Silver, one of the Bank’s most prominent featured artists, our program, and its positive contribution to our local area. Growing up in New York City, Silver has chronicled culture and music on 35mm film and slides, including Hudson Valley icons Pete Seeger and The Band. When asked how his photography has changed evolving into the digital era, Silver describes the “mindset as the same, as a photographer, it is all internal editing.” Walking through his current exhibit, Silver explains the approach of contrasting through early images of himself and his children to current ones he has taken. “We are honored to have such amazing artists at the flagship branch”, stated Brian McFarlane as he explains the positive response the program receives from the community. He continues to explain the uptick in the positive vibe and level of curiosity among Bank visitors since the program began. Rhinebeck Bank is always happy to hear from additional artists who would like to show their art, and will work with them to schedule a viewing period in one of their branches. Interested parties can reach out to the Bank by emailing Artwork@RhinebeckBank.com. Simply submit a sample of your work and which branch, Beacon or Rhinebeck, you are interested in. The program is entirely free to participate in. There is no cost to hang or display work, nor does the bank take any commission on works that are sold as a result of any publicity. Hudson Valley Philharmonic makes their debut on Wake Up with Rhinebeck Bank! Randall Craig Fleischer, HV Philharmonic Music Director and Chris Silva, Bardavon Executive Director debut on this week's episode of "Wake Up with Rhinebeck Bank." As the oldest continuously operating theater in New York, the Poughkeepsie-based Bardavon is known for its aesthetically beautiful building, world class art education programs, and as a vibrant part of the community. On this episode, learn about the success of the HV Philharmonic, the Bardavon’s continuous dedication to art education, and much more. One of the key initiatives of the Bardavon is to introduce children in the local area to various arts forms, according to Executive Director Chris Silva. The Bardavon welcomes nearly 20,000 children each year through its various programs. In many instances it is the child’s first exposure to theater arts in a professional setting, to which the “blown mind” becomes a rewarding experience for both the students and Silva. When asked about Rhinebeck Bank’s contribution to The Bardavon’s success, Silva explains it has become a key component to Bardavon's existence. He expressed his gratitude to the Bank for “getting the value of arts” and “consistency and follow through for many years” has made ongoing progress and achievements simpler. Watch the episode here to learn more about The Bardavon and HV Philharmonic. John Koerner of Elite Outfitting Solutions makes his debut on Wake Up with Rhinebeck Bank! John Koerner, founder and owner of Goshen’s Elite Outfitting Solutions, makes an appearance as this week’s guest on “Wake Up with Rhinebeck Bank.” On this episode, learn how this young entrepreneur was able to take his interest in machinery and turn it into a successful EDC (Every Day Carry) business. Beginning as an apprentice in the machine shop of Orange County Choppers, Koerner learned machine programming and began developing metal wallets for himself and close friends during his extra time. After a few short months, amid positive feedback, he began renting time for the machine use to keep up with requests received via personal referrals and social media inquiries. To meet ever-increasing demand, Koerner established Elite Outfitting Solutions. Utilizing his own machinery and work space, he now offers over 50 different products including metal wallets, key chains, and pocket knives. When asked about Rhinebeck Bank’s contribution to his success, Koerner explains the community bank’s outstanding customer service when financing the necessary equipment for his start-up business. Beginning his business at only the age of 24, and in need of one machine, Koerner now owns four machines financed with the Bank and states, “everything works out great with Rhinebeck Bank, nothing but perfection…” Watch the episode here to learn more about Elite Outfitting Solutions. Rhinebeck Bank is pleased to announce another local artist is now on display in Rhinebeck: photographer, Harvey L. Silver. Growing up in New York City, Silver chronicled culture and music on 35mm film and slides, including Hudson Valley icons Pete Seeger and The Band. Early in his career he produced and staged 35mm multi-image slide shows, and was an Assistant Professor of Photography at the Art Institute of Boston. Locally, Silver has had showings at the Gallery@Rhinebeck, Starr Library, and Rhinebeck Bank. He is represented by Getty Images, and his work has been published in The New Yorker, New York Times, Smithsonian Magazine, and The Huffington Post...to name just a few. Currently residing in the Town of Rhinebeck with his wife, Cindy, Silver is an Executive Producer of corporate meetings and events, and involved in independent film production. The Artwork Program at Rhinebeck Bank is aimed at showcasing local artists by giving them a convenient way to reach viewers, get publicity, and sell their works. Rhinebeck Bank is always happy to hear from additional artists who would like to show their art, and will work with them to schedule a viewing period in one of their branches. Interested parties can reach out by emailing Artwork@RhinebeckBank.com. Simply submit a sample of your work and which location, Beacon or Rhinebeck, you are interested in. The program is entirely free to participate in. There is no cost to hang or display work, nor does the bank take any commission on works that are sold as a result of any publicity. Rhinebeck Bank has been an integral part of the community since 1860. They are committed to remaining a local, independent bank; helping people and businesses flourish in the Hudson Valley. For more information about Rhinebeck Bank or any of their products or services please visit: www.RhinebeckBank.com. Dutchess Beer Distributors makes their debut on Wake Up with Rhinebeck Bank! Steven Kondysar Jr.,third generation co-owner of Dutchess Beer Distributors, makes an appearance as this week’s guest on “Wake Up with Rhinebeck Bank.” On this episode, learn how the 85 year-old family business has grown over three generations into the Hudson Valley’s largest wholesale beverage distributor. When asked about how Rhinebeck Bank has been a contribution to their great success, Kondysar explains how the relationship of family once again comes into play. With similar values on business relationships, being able to walk in and say hello can make all the difference. Rhinebeck Bank has been able to provide the means to expand and grow sustainable through the years. Watch the episode to learn more about Dutchess Beer here. Wake Up with Rhinebeck Bank is the Hudson Valley’s online TV talk show with the goal of highlighting striving local businesses, historical sites, and leaders of this strong community. Host Michelle Barone-Lepore interviews guests to showcase happenings and topics of interest to locals to learn a more personable side of the guests, their organizations, and their plans for the future. Watch the show every Monday morning to learn more! Rhinebeck Bank partners with United Way and Dutchess Community College to present a Financial Literacy Workshop on building, repairing, and improving credit! These three organizations are joining forces to present a workshop aimed at educating the public on the importance of establishing credit, as well as how to repair and improve their credit score. This free seminar will take place Thursday, October 18th from 5:30 - 7:30 pm at Dutchess Community College: 53 Pendell Road in Pougkeepsie, NY. Think your credit score is just a number? Find out how it can save you money, help your career, and have a positive impact on many other aspects of your life. It is never too late to improve your credit! The seminar will be taught by guest speaker John Panzella. Panzella, a Hudson Valley resident, is one of the nation’s most experienced credit experts who helps educate high school and college students, consumers, realtors, first-time homebuyers and businesses about all aspects of consumer credit, credit reports, and the credit industry. He is a strong believer in empowering consumers and helping them keep more of their money by paying less for cars and homes, and many other things, which is exactly what a good credit report can help you do. With over 25 years of experience, John is a knowledgeable, respected, and well-known multi-certified credit expert. He conducts credit education workshops all over the country and he is the author of the book "Give Yourself Some Credit! : A Graduate’s Guide to Understanding and Establishing Good Credit." For more information about Panzella, visit his web site at https://johnknowscredit.com/. For additional information, please contact United Way at 845-471-1900. To RSVP for this event visit: www.uwdor.org/register-oct18. United Way of the Dutchess-Orange Region fights for the health, education, and financial stability of every person in our community. In 2016-17, charitable contributions from individuals, businesses and organizations to United Way’s Community Fund supported nonprofit partners in delivering services to 166,122 residents of Dutchess and Orange Counties. For more information on United Way, go to www.uwdor.org. Dutchess Community College, located in Poughkeepsie, offers quality and value for those interested in starting a four-year degree at an acclaimed two-year school, as well as those pursuing a career track.The college, which has one of the lowest tuition rates in the state, awards AS, AA and AAS degrees and certificates and is part of the SUNY system. DCC offers almost 60 programs in an enriching, student-centered environment. Contemporary facilities, outstanding faculty, abundant student activities and a vast artwork collection create a lively, engaging, collaborative community that fosters personal and academic growth. Learn about First Friday on Wake Up with Rhinebeck Bank! Founders, committee members, and attendees share what First Friday Poughkeepsie means to them and the City of Poughkeepsie on this week's "Wake Up with Rhinebeck Bank." A monthly event that has been described as a “movement” for the City of Poughkeepsie is making an impact like never seen before. First Friday Poughkeepsie is a city-wide celebration held on the first Friday of every month from 5:30 p.m. - 8:30 p.m. and aims to increase awareness of the City and showcase it as a thriving, safe, and attractive place to live and do business. Expecting over 2,500 attendees at the next event, First Friday Poughkeepsie truly brought downtown Poughkeepsie to life through positiveness and excitement with the diversity of attendees and supporters. A vibe is being created that hasn’t been felt in decades. With local restaurants and shops staying open late, pop-up shops and local vendors lining the streets, and local performers taking the stage, there truly is something for everyone! Chrissa Santoro, External Communications Director of the Omega Institute, makes an appearance as this week’s guest on “Wake Up with Rhinebeck Bank.” On this episode, learn how the nonprofit, donor-supported educational center has helped people and organizations integrate their social growth and social changes using holistic techniques for over 40 years. Located on 250 acres of land in Rhinebeck, New York, the Omega Institute is considered a part of the heart of the Hudson Valley and welcomes nearly 23,000 guests during their peak summer season. Through a variety of educational experiences, workshops, and wellness driven services, Omega is fully dedicated to fulfilling their mission of “awakening the best human spirit.” Santoro also explains Omega’s full support of local sustainable produce, as they purchase from over 20 local farms to provide healthy and delicious meals in their cafe and dining hall. Crediting Rhinebeck Bank as “a pleasure to work with” and “instrumental in seasonal success”, Santoro explains the Bank’s key role in sustaining growth for businesses that are season-focused. Also, Omega's Center for Sustainable Living, a leading environmental education center and one of the "greenest" buildings in the world, was cited by Santoro as an example where Rhinebeck Bank's commercial lending opportunities helped further the Institute's growth. Jim and Gina Sullivan make their debut on "Wake Up with Rhinebeck Bank" to discuss the restoration of their property at 40 Cannon Street. Jim and Gina Sullivan, owners and restorers of 40 Cannon, make an appearance as this week’s guests on “Wake Up with Rhinebeck Bank.” On this episode, learn how the original 1915 hotel was transformed into the newly renovated, contemporary commercial and residential property it is today, as well as the Sullivan’s ongoing vision for both 40 Cannon and the City of Poughkeepsie. Being fully occupied, 40 Cannon has already exceeded the couple's original expectations to be more of an experience to tenants, rather than solely an apartment building with various networking and commercial events. Jim Sullivan credits Rhinebeck Bank’s financing, partnership and commitment to improving the communities they serve as a component of their success. With future plans including a wine cellar and art gallery, 40 Cannon is becoming a staple in the City of Poughkeepsie. Rhinebeck Bank Announces New Artist on Display: Gregg Isaacson. Rhinebeck Bank is pleased to announce that another local artist is now on display in Rhinebeck: Gregg Isaacson. Isaacson was born in Brooklyn, N.Y and raised in New Paltz, where he graduated New Paltz High School. As a self taught artist, Isaacson has learned the art of photography by always having a camera ready when something inspiring appears. Iaascson describes his art process as "simple and fun." He often is inspired by the beautiful Hudson Valley mountains, hiking trails, and people of the local area. 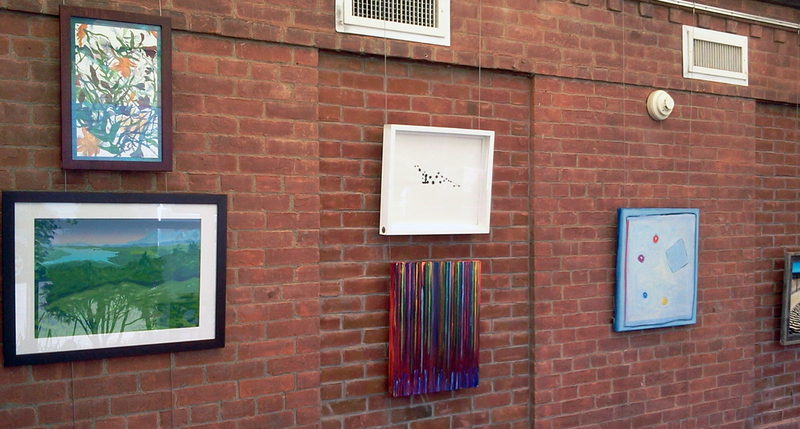 Iaascson's artwork exhibit will be on display in Rhinebeck Bank's Rhinebeck branch from now until October 12th. Stop in during business hours to take a look! His photography can also be viewed online at http://www.greggsphotoworks.com/. Rhinebeck Bank Announces Season 4 Premiere of Wake Up with Rhinebeck Bank! Rhinebeck Bank is proud to announce the return of Wake Up with Rhinebeck Bank's Season 4 Premiere! Summer might be coming to an end, but Wake Up with Rhinebeck Bank is just beginning! Tune in to Wake Up with Rhinebeck Bank starting Monday, September 3rd for an episode on back to school tips and ways to help your children be prepared for the new year! Rhinebeck Bank wishes everyone a great school year full of learning and fun. Future Season 4 episodes will launch weekly on Monday mornings and can be found on Rhinebeck Bank’s Facebook page. Also stay tuned for next week's episode in honor of September 11th, airing Tuesday. Wake Up with Rhinebeck Bank made its debut on June 6, 2016 with the show’s goal of highlighting striving local businesses, historical sites, and leaders of this strong community. Host Michelle Barone-Lepore interviews guests to showcase happenings and topics of interest to locals. Her energy, engaging guests, and love of the Hudson Valley have really made the show a hit. The show’s objective is to learn a more personable side of the guests, their organizations, and their plans for the future. For almost three years Wake Up with Rhinebeck Bank has become a staple for local people and their Monday mornings! Wake Up With Rhinebeck Bank partnering with a new creative team has a whole new spin! Watch the weekly show to learn more! To learn more about the show, upcoming episodes, or to become a guest visit: https://wakeuprhinebeck.com//. Rhinebeck Bank is proud to announce that Sharon Whiteley has been promoted to Branch Manager. In her new role, she will be managing the Bank's Hyde Park branch location in Dutchess County. Whiteley began her career with Rhinebeck Bank in 2008 as a Senior Teller and worked her way up to management. With over 10 years of banking experience, she formerly served as Assistant Branch Manager in Hyde Park, as well as Sales & Service Manager and Branch Team Leader in the Rhinebeck branch. Whiteley has an Associate's Degree in communications from Dutchess Community College and an Associate’s Degree in film production from Full Sail University. She is also an active member of the Roosevelt Vanderbilt Historical Society. Whiteley strives to go above and beyond to ensure that all of her customers receive the best service possible. She says, “I take pride in providing Rhinebeck Bank customers with outstanding customer service, while also helping them obtain their financial goals.” Whiteley possesses not only the skills to be successful in her role, but the compassion and dedication to serve her customers and her community. She notes, “Rhinebeck Bank stands out from the rest because we recognize the importance of being active in the community we serve.” She enjoys giving back to the community by volunteering for the Dutchess County SPCA. ﻿Whiteley resides in the Hudson Valley and loves every minute that she gets to spend time with family and friends. In her free time she also enjoys gardening, swimming, hiking, and cooking. Omar Mahmud has been promoted to Red Hook Branch Manager at Rhinebeck Bank. Mahmud received his Bachelors of Science in Business of Administration, concentrating in Marketing from Marist College, and has always had passion for working in a local community. He began his career at Rhinebeck Bank as a Float Teller in the northern region of the Hudson Valley in 2014, and is now excited to continue building relationships to help local businesses and individuals in the community. Mahmud takes a strong initiative in the Hudson Valley Young Professionals and is continuously volunteering for various events and charities that better the local area. During his spare time, Mahmud enjoys traveling and spending time with family and friends. For 158 years, Rhinebeck Bank has been an integral part of the economic growth and a driving force for commerce along the Hudson River. Over the years they have remained local, with their headquarters in Dutchess County. Rhinebeck Bank prides themselves in being personally involved in the local business communities and charitable organizations. Their ability to be responsive to the needs of their customers and community has ensured their continued growth. All decisions, policies and loan approvals are made locally by people who live and work in the area. For more information about Rhinebeck Bank or any of their products or services please visit: www.RhinebeckBank.com. Rhinebeck Bank Announces New Artist on Display: Emily Marchesiello. Rhinebeck Bank is pleased to announce that another local artist is now on display in Beacon: Emily Marchesiello. Marchesiello is a graduate of the Masters of Fine Arts program at Queens College CUNY. She is a visual artist who specializes in fine point line drawing, oil painting and watercolor painting. Emily derives her inspiration from both the natural world and the fantasy realm. For Marchesiello, the process of intentional mark-making is a meditation - each line, dot and swoosh of color is a physical manifestation of thought, while at the same time a product of mindless release. Marchesiello's artwork exhibit will be on display in Rhinebeck Bank's Beacon branch from now until September 22nd. Stop in during business hours to take a look! Her artwork can also be viewed online at http://emilymarchesiello.com/. Rhinebeck Bank to sponsor 3rd Annual Dutchess County Fair Spork Run! Rhinebeck Bank is excited to announce they will once again be partnering with the Dutchess County Fair to hold the 2018 Spork Run Event.The Spork Run will be held on opening day, Tuesday, August 21st at 11:00 am in front of the Administration Building. Join us for all the excitement at the Dutchess County Fair, August 21-26. Advanced ticket sales are available online and at select outlets throughout the Hudson Valley. Plan a day of fair fun on the Dutchess Fair App or at www.dutchessfair.com! Rhinebeck Bank is proud to announce that Amy Van Amburgh has been promoted to Branch Manager. In her role she will be managing the Bank's Goshen branch location in Orange County. Amy began her career with Rhinebeck Bank in July 2017 as the Sales and Service Manager for the Red Hook branch. She brought with her previous banking experience gained through her former role as Assistant Branch Manager at Hudson Valley Federal Credit Union. Amy has an Associate's Degree from Ulster Community College, and a Bachelor's Degree from SUNY New Paltz. She is also the former class president and graduate of the 2014-2015 Ulster Leadership Program. Ever since joining the Rhinebeck Bank team, Amy has gone above and beyond to ensure that all of her customers receive the best service possible. Amy says, "I am thrilled to work with an established organization that allows for growth opportunities within my profession, and I am passionate about helping our customers attain their financial goals. Working for a financial institution that gives back to our community is important to me." Amy possess not only the skills to be successful in her role but the compassion and dedication to serve her customers and her community. Amy brings extensive employee training skills to the table as well, including White Belt Six Sigma Training and Reality Based Leadership Training, which will help the Bank continue to grow and develop. ﻿Recently married, Amy resides in the Hudson Valley with her husband and loves every minute that she gets to spend time with family. In her free time she also enjoys shooting pool, fishing, and being outdoors. We are pleased to announce that Alex Morphet has been hired as an Infinex Financial Advisor at Rhinebeck Asset Management. Alex comes to Rhinebeck Asset Management from Hudson Valley Federal Credit Union with 17 years of experience in the Financial Services industry. During his tenure as a Financial Advisor, Alex assisted clients with their financial planning needs including investments, retirement, insurance, and estate planning. Keeping his attention local, Alex will continue focusing on individuals of the Hudson Valley as a Financial Advisor at Rhinebeck Asset Management servicing the Hyde Park, Arlington and Mid-Hudson branch locations of Rhinebeck Bank. Alex currently holds his Series 6, 7 and 63 Registrations, New York State Life, Accident and Health License, and is certified with the New York State Partnership for Long Term Care. As a resident of Hyde Park, Alex is actively involved with Hyde Park and Millbrook Youth Swimming Club, Misfit Farms Horseback Riding, as well as being a member of the Hyde Park Schools Parent Teacher Association. Of his new position he said: “Working for Rhinebeck Asset Management, a division of Rhinebeck Bank, is important to me because of their long and successful history as a trusted institution for the financial needs of individual customers, businesses and organizations. Equally as important to me, they have solidified themselves as a Financial Institution dedicated to involvement in the local community and making the Hudson Valley an even better place to live.” As a Financial Advisor, Alex's experience and commitment to the Hudson Valley will allow him to continue assisting and advising our local residents. A proud father of two, Alex enjoys spending time with his wife and daughters, golfing, and fishing. From June 30th until August 25th, students from The Art Effect will have their pieces on display at Rhinebeck Bank’s Rhinebeck branch location. This exhibit continues the partnership between Rhinebeck Bank and The Art Effect, who will be showcasing student artwork in the branches periodically throughout the year. The Art Effect is an organization that offers classes, courses and other resources to empower youth through forms of art and media. Based out of the Hudson Valley, The Art Effect assists in the growth of the community and their youth by promoting self-expression and personal development. In this showcase, Emily Canning, Chloe Mosbacher, Molly Stark, Yanlam Ko, Claire Wu, and Anthony DiBattista will have their work on display. These individuals are current students of The Art Effect’s Art Institute. Officially established in December 2017, The Art Effect is a merger of former organizations Mill Street Loft and Spark Media Project. Emily Canning graduated from John Jay High School last month. Following her graduation she will be attending the Fashion Institute of Technology to work towards her BFA in Photography. To date, she has taken multiple pre-college classes at FIT and The Art Effect. She has also had her work displayed at multiple shows including Scholastic Art & Writing, the NY State Media Art Teachers Association, and others. Chloe Mosbacher is a recent alum of The Art Effect and is preparing to attend Maryland Institute College of Art in the fall. In her recent work “Wakeup Call,” she exhibits large scale mixed media paintings and explores ideas related to identity, Bildungsroman (coming of age), and social commentary. Through a mix of these pieces she combines contemporary figuration and texture with historical allusions and classical symbols. Her work has been displayed in several local venues including SUNY New Paltz, Vassar College and more. To contact Mosbacher about her work please email her at chloemosbacher@gmail.com or follow her Instagram account, @_chloemoss. Claire Wu is a recent graduate of John Jay High School and of The Art Effect. She will be attending Pratt Institute in the Fall. Past experience and exhibits include Gallery 66 from 2014-2016, Teen Visions in 2017, and Exposure in 2018. Wu also participated in the Garrison Mentor Program from 2016-2017 at Garrison Art Center. For inquiries, Wu can be contacted at clairewu12340@gmail.com. Anthony DiBattista recently graduated from John Jay High School. In the fall he is set to attend The Cooper Union. His work has been featured in a variety of showcases including Hudson Valley LGBTQ Community Center Student exhibit and Fishkill Solidarity Event. To contact DiBattista on his art work please contact him at (845) 204-4562 or visit his public Facebook page here . Learn how you can own your own house in a free seminar presented by Rhinebeck Bank, Hudson River Housing, and United Way on June 28th! Vincent Aurigemma, VP Residential Mortgage Lending at Rhinebeck Bank, will lead this seminar for all interested in knowing more about the process of becoming a home owner. Purchasing your first home may initially seem like a daunting task. We dream of the particular specifications we want in a house but find ourselves lost in how to make our dreams become reality. If you think that you are alone in your hesitation to purchase a home, rest easy knowing that more than half of America is in the same boat. According to an article published by Forbes, “only 34 to 36 percent of the population of adult Americans under the age of 35 owned a home in 2015.” Buying a home comes with its share of challenges, but there are steps you can take to prepare yourself. Join us for our First Time Homebuyers Seminar on Thursday, June 28th from 5:30 to 7:30pm at the Poughkeepsie Underwear Factory (8 North Cherry Street, Poughkeepsie). Learn the strategies of how to qualify for a home purchase, budgeting skills, and what to expect from the home buying process. This is the second Financial Literacy Workshop co-presented by Rhinebeck Bank and United Way of the Dutchess-Orange Region. Hudson River Housing has joined them to bring you an informative seminar that will help you begin your home buying process. This workshop will be led by Vincent Aurigemma, the Vice President of Residential Mortgage Lending at Rhinebeck Bank. Mr. Aurigemma has over 25 years of experience in operations, sales, and sales management with the most recent 14 years spent in the mortgage industry. Vincent is an affiliate member of the Dutchess County Association of Realtors (DCAR), the Ulster County Board of Realtors (UCBR) and he currently serves as the Vice President of the Mid Hudson Valley Mortgage Bankers Association (MHVMBA). He enjoys spending time with his wife of 22 years, Maureen, and their 3 children. Vincent has been a high school boys basketball official for the past 13 years and serves as the President of the International Association of Approved Basketball Officials (IAABO), Mid Hudson Valley Board #114. Vincent knows the Hudson Valley Region and all the nuances of its mortgage industry. “Being part of a secure, local community lender,” is what makes him want to be a part of Rhinebeck Bank. “Helping to develop products and programs that will allow more people to take advantage of the benefits of owning a home,” is his goal while he heads Rhinebeck Bank’s Mortgage Department. The June 28th program will be held at the Poughkeepsie Underwear Factory (8 N Cherry St, Poughkeepsie, NY, 12601). To register for this free workshop, go to: www.uwdor.org. For additional information, please contact United Way’s Community Impact Coordinator Jazmin Awada at 845-471-1900 ext 3106 or jawada@uwdor.org. Rhinebeck Bank has been an integral part of the community since 1860. They are committed to remaining a local, independent bank; helping people and businesses flourish in the Hudson Valley. For more information about Rhinebeck Bank or any of their products or services please visit: http://www.rhinebeckbank.com. United Way of the Dutchess-Orange Region fights for the health, education, and financial stability of every person in our community. In 2016-17, charitable contributions from individuals, businesses and organizations to United Way’s Community Fund supported nonprofit partners in delivering services to 166,122 residents of Dutchess and Orange Counties. For more information, go to www.uwdor.org. Mark Malone, SVP Rhinebeck Bank, graduates from the ABA Stonier Graduate School of Banking and the Wharton School of Business Leadership Program! Rhinebeck Bank is proud to announce that Mark Malone, SVP Area Sales Leader of Rhinebeck Bank has graduated from the ABA Stonier Graduate School of Banking and the Wharton School of Business Leadership Program. Stonier is specifically designed to prepare senior-level bankers and regulators for the decision-making and oversight required to navigate in challenging times. The school is focused on providing knowledge and skills to recognize and address high-level management issues, and implement effective solutions. Leadership courses are taught by faculty from the Wharton School of Business and are designed to help senior-level bankers take on broader responsibilities, lead change, and create more value for their organizations. After graduating Stonier, Malone says, "My biggest takeaway is that technology is and will continue to be a driving force in the banking industry. Banking, particularly the way we bank, is evolving everyday. Community banks must be prepared to marry the relationships they’ve built with their customers, with continuous technology enhancements to be successful. This challenge is top of mind at Rhinebeck Bank, and I believe we’re doing a great job responding. The Bank is continuously looking for new ways to meet our customers needs." Malone believes that Stonier has helped him look more globally at issues facing the Bank and contribute to identifying potential solutions. He plans to take what he has learned and apply it directly to his work at Rhinebeck Bank. Malone comments on his commitment to the Bank, "I’m committed to being a part of Rhinebeck Bank’s long term success here in the Hudson Valley. Attending Stonier prepared me to contribute to this success at a higher level." NOTICE IS HEREBY GIVEN that on June 12, 2018, the Board of Directors of Rhinebeck Bank, a New York-chartered stock savings bank with its executive offices/headquarters located at Two Jefferson Plaza, Poughkeepsie, New York, and the Board of Trustees of Rhinebeck Bancorp, MHC, a New York-chartered mutual holding company, unanimously approved a Plan of Reorganization and Minority Stock Issuance, whereby Rhinebeck Bank and Rhinebeck Bancorp, MHC will reorganize into the “two-tier” mutual holding company structure by forming a new corporation, Rhinebeck Bancorp, Inc., to become the holding company for Rhinebeck Bank. Rhinebeck Bancorp, Inc. will be established as a Maryland-chartered corporation and will be a majority-owned subsidiary of Rhinebeck Bancorp, MHC so long as Rhinebeck Bancorp, MHC remains in existence. Concurrently with the reorganization, Rhinebeck Bancorp, Inc. intends to offer for sale up to 49.0% of its common stock in a subscription offering and, if necessary, in a community offering, a syndicated community offering, a firm commitment offering, or a combination thereof. The amount and number shares of common stock to be offered for sale will be determined by an independent appraisal. The Plan of Reorganization and Minority Stock Issuances establishes December 31, 2016 as the eligibility record date for determining the eligible depositors of Rhinebeck Bank entitled to first priority non-transferable subscription rights to subscribe for shares of common stock of Rhinebeck Bancorp, Inc. The Plan of Reorganization and Minority Stock Issuance also provides for the establishment of a charitable foundation that will be funded with shares of Rhinebeck Bancorp, Inc. common stock and cash. The charitable foundation will be dedicated to supporting charitable causes and community development activities in the communities in which Rhinebeck Bank operates. A copy of the Plan of Reorganization and Minority Stock Issuance is available for inspection by Rhinebeck Bank depositors at each banking office of Rhinebeck Bank. The reorganization and stock offering will not affect loans and deposit accounts at Rhinebeck Bank and all insured deposit accounts will remain insured by the Federal Deposit Insurance Corporation up to the applicable legal limit, without interruption. Each office of Rhinebeck Bank will continue to operate after the completion of the reorganization and stock offering. The Plan of Reorganization and Minority Stock Issuance is subject to approval by the New York State Department of Financial Services (the “DFS”) and by depositors of Rhinebeck Bank. The acquisition of Rhinebeck Bank by Rhinebeck Bancorp, Inc. is subject to the approval of the Board of Governors of the Federal Reserve System and the DFS. Randi Zinn makes her debut on "Wake Up with Rhinebeck Bank!" Randi Zinn, founder of Beyond Mom and author of Going Beyond Mom makes an appearance as this week’s guest on “Wake Up with Rhinebeck Bank.” On this episode learn about the life and mission of Randi Zinn, including the empowering company she founded and her inspiring new novel. Brian Altmann, President of DBS Remodel, has teamed up with Rhinebeck Bank & Page Kitchen & Bath Showroom to present a free public seminar about kitchen remodeling—a project that can cause homeowners stress when they’re not equipped with the right knowledge and/or the right knowhow. When it comes to any type of home remodel, most homeowners would agree that they’re not particularly sure where to start, especially in today’s market where kitchens and bathrooms add a bulk of value to homes. These three businesses recognized the anguish homeowners feel when tackling these types of projects on their own. Each being dedicated local companies, they came together to host a seminar that discusses exactly what’s needed to have a successful remodel. The “Kitchen Remodeling” seminar will feature kitchen trends, financing options, and how to hire a contractor—all the ingredients needed to take on a kitchen remodel successfully! The seminar will take place at Page Home Centers in Poughkeepsie, on June 14th at 6:00pm. Attendees will be able to meet with professionals in each industry, learn more about the process, and discuss their projects, all while enjoying light refreshments. To learn more about the seminar & reserve your seat, please visit dbsremodel.com/events or call (845) 485-8343. Rhinebeck Bank employees participate in Leap for Autism to support Greystone Programs! On this week’s episode of Wake Up with Rhinebeck Bank, meet Stefania Riccitelli and Becky Bova, two Rhinebeck Bank employees who took Greystone Program’s ‘Leap for Autism’ after raising over $1,000 for the organization! Greystone Programs is a non-profit organization that supports families, adults and children living with various developmental disabilities. Their organization is built on the values of respect, integrity, compassion, honesty and diversity. On April 21st, 2018 they held their Leap for Autism event where participants looked to raise money to help Greystone continually provide life –enriching programs to those who need it most. If a participant raised over $500 they had the option to skydive from an amazing13,500 feet. Rhinebeck Bank’s brave employees raised the money and took the leap! Produced in partnership with HVNN, Wake up with Rhinebeck Bank is the Hudson Valley’s online TV talk show featuring guests from the local community including business owners, community leaders, political figures, and Rhinebeck Bank employees. The show’s objective is to learn about guests personally, as well as their organizations and what they have planned for the future! To find out more information or to watch past episodes visit, https://www.facebook.com/RhinebeckBank/, and if you'd like to be a guest on the show, email PR@RhinebeckBank.com. Prudence Haze’s Full Bloom collection is now on display in Rhinebeck Bank’s Rhinebeck branch location. Rhinebeck Bank has always had a passion for supporting the arts sector. At the Rhinebeck and Beacon branch locations, artists from the local Hudson Valley community and surrounding areas have the opportunity to showcase their work in the available display space. Haze is a returning member of the Artwork Program and her new collection will be on display until the end of June. Through her Full Bloom collection she hopes to capture the beauty and color found in nature during this picturesque time of the year. As the weather has finally begun to heat up and stay warm there is no better time for these pieces to be released! Haze is a self-taught artist based in the Hudson Valley. At the age of 20, Haze began to develop her love and passion for the arts. During this time she realized that this was her true passion and she set off on her journey to pursue a professional career as an artist. During the past two years, she has had her work displayed in over 30 shows and she plans to continue this success by participating in another 25+ shows by the end of this year. Rhinebeck Bank’s Artwork Program showcases are an excellent way for artists to expand their reach within the community. If you are interested in participating please contact Artwork@RhinebeckBank.com. In your email please include a small sample of your work and which branch you are interested in working with. Participation in the Artwork Program is free, there are no fees associated with hanging or displaying art, and if artists sell their work they keep all proceeds. From April 30th until June 30th, students from The Art Effect will have their pieces on display at Rhinebeck Bank’s Beacon branch location. This exhibit will launch the partnership between Rhinebeck Bank and The Art Effect, who will be showcasing student artwork in the branches periodically throughout the year. Emily Canning is a senior at John Jay High School and is set to graduate in June. Following her graduation she will be attending the Fashion Institute of Technology to work towards her BFA in Photography. To date, she has taken multiple pre-college classes at FIT and The Art Effect. She has also had her work displayed at multiple shows including Scholastic Art & Writing, the NY State Media Art Teachers Association, and others. Claire Wu is a senior at John Jay High School and recent graduate of The Art Effect. She will be attending Pratt Institute in the Fall. Past experience and exhibits include Gallery 66 from 2014-2016, Teen Visions in 2017, and Exposure in 2018. Wu also participated in the Garrison Mentor Program from 2016-2017 at Garrison Art Center. For inquiries, Wu can be contacted at clairewu12340@gmail.com. Anthony DiBattista is a senior at John Jay High School. In the fall he is set to attend The Cooper Union. His work has been featured in a variety of showcases including Hudson Valley LGBTQ Community Center Student exhibit and Fishkill Solidarity Event. To contact DiBattista on his art work please contact him at (845) 204-4562 or visit his public Facebook page here . Rosa Hoag has been promoted to AVP, Business Development Officer. Rhinebeck Bank is proud to announce that Rosa Hoag has been promoted to AVP, Business Development Officer. In her role she will be developing business in Southern Dutchess, Putnam and Westchester counties. Rosa Hoag began her career with Rhinebeck Bank in October of 2016 as AVP, Multi-Site Branch Manager. She brought with her extensive banking experience gained through her previous roles at M&T Bank, Key Bank and Wachovia/Wells Fargo. Ever since joining the Rhinebeck Bank team, Hoag has gone above and beyond to ensure that all of her customers receive the best service possible. Hoag says, "At Rhinebeck Bank, key decisions are made locally by people who live in the community. They have face-to-face relationships with their customers and understand local needs." Hoag possess not only the skills to be successful in her role but the compassion and dedication to serve her customers and her community. ﻿Currently, Hoag resides in Dover Plains with her husband and two children. During her time at Rhinebeck Bank she has been able to continually immerse herself into both the Beacon and Wappingers Falls areas. In this new role her exposure to the surrounding areas and their communities will only grow. David Curry has been promoted to AVP, Community Lender. Rhinebeck Bank, your local community bank, announces the continued expansion of their Commercial Lending Team with the promotion of David Curry to AVP Community Lender. Curry began working at Rhinebeck Bank in 2014 as a Universal Banker. He strives to not only better the bank but the local community it serves as well. Within two years, he was promoted to AVP Branch Manager of their Fishkill location and just two short years later, he is now moving into his new position in Commercial Lending. Curry was born and raised in Poughkeepsie and has always been immersed in the Hudson Valley community. He is a graduate of Rider University with a B.S. in Finance and a minor in Economics. He is a graduate of the Leadership Dutchess class of 2017 where he served as co-chair of the Finance Committee. This year, he is a recipient of the Dutchess County Regional Chamber of Commerce’s Forty Under 40 Mover and Shaker Award. Curry is passionate about giving back to his community. He currently serves as the Board President for the Fishkill Business Association and is a Board Member for Mental Health America. He is deeply involved with the Chamber Foundation where he serves in many roles, such as committee member of the Pigskins and Pints fundraiser event, mentor for Leadership Dutchess, and the Chair of Hudson Valley KidVenture’s Touch-a-Truck committee. Brian McFarlane, Carolyn Manfreda-Haines, and Lisa Reed have all been promoted to AVP, Area Branch Manager at Rhinebeck Bank. Rhinebeck Bank, your local community bank, announces their new Area Branch Managers. Brian McFarlane, Lisa Reed, and Carolyn Manfreda-Haines have all assumed their new roles within the bank. All three newly named Area Branch Managers have been part of the Rhinebeck family for some time and have over 41 combined years of banking experience. They are all grateful to be able to work for an organization they can grow with, and which supports their efforts to give back to the communities in which they live and work. McFarlane will now oversee both the Rhinebeck and Red Hook locations, Reed the Mid-Hudson and South Road locations, and Manfreda-Haines the Beacon, Fishkill and East Fishkill locations. McFarlane was most recently AVP Branch Manager of the Rhinebeck location. He is a graduate of SUNY Albany where he received his bachelor’s degree, and then completed his Master of Business Administration at National University. McFarlane has been a proud resident and community member of the Hudson Valley area since 1987. Reed began her career with Rhinebeck Bank in 2005 as a part-time teller. She has moved up in the organization through various roles including Senior Relationship Banker, Assistant Branch manager and most recently Branch Manager of the Mid-Hudson location. Reed also serves as a Notary Public in the branches and was a 2017 graduate of Leadership Dutchess. Manfreda-Haines was hired at Rhinebeck Bank in 2007 as a Relationship Banker. She was promoted to Branch Manager of the East Fishkill branch in 2012, later moving to the Arlington branch. Most recently, she was Branch Manager at the Red Hook location. She attended Dutchess Community College where she studied Business Administration and was a 2014 graduate of Leadership Dutchess. Manfreda-Haines is a member of the East Fishkill Rotary Club and has also served on the Board of Directors of Habitat for Humanity. For 158 years, Rhinebeck Bank has been an integral part of the economic growth along the Hudson River and a driving force for commerce. Over the years they have remained local, with their headquarters in Dutchess County. Rhinebeck Bank prides themselves in being personally involved in the business communities and charitable organizations. And, it is through their ability to be responsive to the needs of their customers that they continue to grow. All decisions, policies and loan approvals are made locally by people who live and work in the area. For more information about Rhinebeck Bank or any of their products or services please visit: www.RhinebeckBank.com. The Big Cheese Giveaway at Rhinebeck Bank! Learn more about K104.7’s Big Cheese Giveaway on this week’s pisode of Wake Up with Rhinebeck Bank! This week Angelo Notoro, radio show host of K104.7, will share the inside scoop on the Big Cheese Giveaway, sponsored by Rhinebeck Bank. Also, find out more details about the Hudson Valley Mac & Cheese Festival, happening Saturday, April 28th. The Big Cheese Giveaway will take place on April 21st from 10am-12pm, at Rhinebeck Bank’s Goshen branch . At the event, there will be 200 boxes of mac and cheese displayed and each will be filled with a special prize. These prizes include: tickets to the Mac and Cheese Festival, gift certificates to local restaurants and venues, and one ultimate grand prize of $1,047. For your chance to win stop by the Goshen branch on April 21st and take your pick of the mac and cheese boxes. During the giveaway hours, K104.7 and The Woodman from the Woodman in the Morning Show will be on location as the MC! The event will also feature a face painter for kids, Rhinebeck Bank balloons and gourmet mac and cheese samples provided by Cornucopia Concepts! Watch the episode by clicking the link: The Big Cheese Giveaway is Coming! Following this giveaway, the Mac and Cheese Festival will take place in Washingtonville, New York at the Brotherhood Winery on Saturday April 28th from 1pm to 5pm. To purchase tickets before they sell out please visit their online ticket service here. Each ticket includes entry to the festival and a self guided tour of the winery. Both Rhinebeck Bank and K104.7 are proud sponsors of the Mac and Cheese Festival. Look forward to a fun afternoon filled with some of the best mac & cheese in the Hudson Valley! For more information on the event please visit their Facebook page here. Philip Bronzi has rejoined Rhinebeck Bank! He is now Senior Vice President, Commercial Lending Director. The leader in commercial lending in the Hudson Valley, Philip Bronzi, has been hired back at Rhinebeck Bank, now taking an executive role as Senior Vice President, Commercial Lending Director. Bronzi received his Bachelor’s degree from the University at Albany in 1999, and has been working in the Commercial Lending industry for almost a decade. Previously working for TD Bank, CMS Bank and Tompkins Mahopac Bank, Bronzi brings a wealth of experience to Rhinebeck Bank’s Commercial Lending team. He adds the utmost value to the Bank due to his unprecedented knowledge and experience in the commercial lending industry throughout the Hudson Valley. Bronzi has tremendous goals, with plans to take the Bank, and the community, to new heights. His main goal is to be in a position of greatest impact to help local businesses and the local community overall. “The businesses we support are the pillars of economic growth and vitality here in the Hudson Valley; helping them helps to make the entire area a better place to live, work and play.” Working at a community bank such as Rhinebeck Bank allows him to achieve his goals. Bronzi’s extensive knowledge will help the Bank expand and develop new markets, while his leadership will help strengthen and improve the team’s initiatives and efforts. The better the team, the better the Bank can continue to enhance customer service, support the many businesses in the local area and grow the community. Bronzi, a graduate of Leadership Dutchess, believes so much in the community that he too lives, works, and plays in the Hudson Valley. He sits on the Dutchess County Regional Chamber of Commerce’s Board as an Associate Board Member, participates on their After Hours Committee as Chair, is involved in the Legislative Action Committee as Co-Chair, and he serves as co-chair of the Forty under 40 selection committee. He serves as Board Treasurer for Sparrow’s Nest and works closely with the Anderson Center for Autism for which he is a Board Trustee. Bronzi enjoys spending his time with his wife and five children as well as reading in his free time. The two organizations will be presenting a series of workshops aimed at educating the public on an array of financial subjects ranging from fraud to home buying and everything in between. The first workshop will be presented by John F. Viola, United States Postal Inspector Team Leader. John is a supervisory federal agent with the US Postal Inspection Service with over 23 years experience investigating crimes involving the US Mails. John will be joined by Donna Harris, the Public Information Representative (PIR) for the US Postal Inspection Service in New York. Donna has been in her current position for over five years, and has worked at the United States Postal Service and its law enforcement agencies for over 32 years. John Viola and Donna Harris will provide an overview of the U.S. Postal Inspection Service and mail theft prevention as well as how to avoid falling victim to identity theft, lottery and sweepstakes schemes, and work-at-home, investment and charity schemes. Elizabeth Roger, Business Banking Officer at Rhinebeck Bank will also be available to answer audience questions following the presentation. In addition, there will be two more workshops in fall 2018 and one in January 2019 (locations, dates and times to be announced). Topics to be addressed include “Basic Budgeting for Youth,” “Information for First Time Homebuyers,” and “How to Have a ‘Second Chance’ with Poor/No Credit or Bankruptcy.” All of the Financial Literacy Workshops are free and open to the public with pre-registration requested. To register for the April 5th workshop, go to www.uwdor.org/register-april52018. The April 5th workshop will be held in the Green Room at the Boardman Road Library (141 Boardman Road) from 9:30 – 11:00am. Registration is from 9:00-9:30am. Light refreshments will be served. To register for this free workshop, go to: www.uwdor.org/register-april52018. For additional information, please contact United Way’s Community Building VISTA Jazmin Awada at 845-471-1900 ext 3106 or jawada@uwdor.org. Rhinebeck Bank has always had a passion for supporting the arts sector. At both their Rhinebeck and Beacon branch locations, there is gallery space available for artists to display and/or sell their artwork. For the next several weeks, Cecelia Sinclair and Prudence Haze will be the featured artists on display. Cecelia Sinclair’s artwork will be displayed in the Rhinebeck Branch until April 6th. As a resident of the area, the inspiration for her work has been derived from locations here in the Hudson Valley. Sinclair states, “I have found the buildings to be beautiful especially after dark.” She has an amazing ability to capture the life and liveliness of the Hudson Valley in her work. Sinclair’s accomplishments include membership in the Columbia County Council of the Arts and recognition as a 2012 NYSA Mark Artist. For purchasing information and other inquires on Cecelia Sinclair’s work please email ceilie42@yahoo.com. Prudence Haze’s “Rebirth” showcase will be on display at the Beacon Branch until April 28th. Haze is a self taught psychedelic artist who has explored the deep realms of the subconscious mind. From a young age Haze has always found her artistic abilities and through the years has displayed her work in a various shows and galleries. Her artwork primarily focuses on the use of acrylic paints but she is known to use a variety of other mediums as well. Her future plans include continuing her studies in psychology and art therapy. In “Rebirth,” Haze uses color to express this time of renewal and rebirth in all its glory. For purchasing information and other inquires on Prudence Haze’s work please email prudence.haze@yahoo.com. Rhinebeck Bank has been an integral part of the community since 1860. They are committed to remaining a local, independent bank; helping people and businesses flourish in the Hudson Valley. For more information about Rhinebeck Bank or any of their products or services please visit: www.RhinebeckBank.com. Elected Official Sue Serino makes her debut on "Wake Up with Rhinebeck Bank"! On this week's episode of Wake Up with Rhinebeck Bank, find out how Serino got involved in politics and how it became her career! Learn about her local office in Hyde Park, her commitment to mental health causes, and why she loves what she does each day. Click here to watch the episode, Sue Serino on Wake Up with Rhinebeck Bank. Wake Up With Rhinebeck Bank will feature Donna Harris of the United States Postal Inspection Service next Monday, March 19th. Harris will educate you on elder abuse, as well as how to identify and prevent it. Future episodes will run every Monday at 8am on the Bank’s Facebook Page and on HVNN.com. Produced in partnership with HVNN, Wake Up with Rhinebeck Bank is the Hudson Valley's online TV talk show featuring guests from the local community, including business owners, community leaders, political figures, and Rhinebeck Bank employees. The show’s objective is to learn about guests personally, as well as their organizations and what they have planned for the future! To find out more information or to watch past episodes visit, Wake Up with Rhinebeck Bank . Rhinebeck Bank takes pride in its ongoing support of the Hudson Valley and the people who live here. As a community bank, they help new businesses start, and help old businesses succeed; they are an integral part of our regional economy. Rhinebeck Bank is committed to going even further by volunteering with local organizations and supporting their causes through charitable giving. Each year, the Bank’s Community Outreach program supports a variety of not-for-profit organizations that educate, assist and engage our local residents. From education, arts and youth sports, to housing assistance, family services and economic development, the Bank seeks to improve each aspect of our community. Over the years the Bank has supported such organizations as Family Services, Bardavon, Dutchess County Agricultural Society, the Dutchess County Regional Chamber of Commerce, and others. In addition, a large number of the Bank’s employees actively volunteer with local not-for-profits. Employees organize and attend events, lead fundraising initiatives, walk many miles at rallies, and even serve as board members of organizations and foundations. Community support is not a Bank goal – it is a part of the company’s culture. Whether it’s a small organization looking to grow, a youth soccer team hoping for a sponsorship, or a charity in need of volunteers, Rhinebeck Bank is there with a helping hand whenever they can. To obtain their Sponsorship Request form, email Info@RhinebeckBank.com at least six (6) weeks in advance. ﻿Rhinebeck Bank has been an integral part of the community since 1860. They are committed to remaining a local, independent bank; helping people and businesses flourish in the Hudson Valley. For more information about Rhinebeck Bank or any of their products or services please visit: www.RhinebeckBank.com. Michael Mazzuca has been hired as the Vice President of Business Development at Rhinebeck Bank. Mazzuca received his Bachelors degree in Sociology with a minor in Psychology from SUNY New Paltz, and an additional Associates degree in Business Administration from Dutchess Community College. Mazzuca has worked in banking for over 15 years, starting at JP Morgan Chase Bank in 2000. He formerly served as Vice President of Commercial Lending at Riverside Bank and as Small Business Banker at TD Bank. Most recently, he was the Vice President of Corporate Partnerships for the Hudson Valley Renegades. Mazzuca is a SCORE counselor for Orange County, and is currently studying for his NMLS license. He is a trustee of the United Way of Dutchess-Orange's board, on the board of trustees for the Foundation of Vassar Brothers Medical Center, and participates in the Southern Dutchess Exchange Club. Along with volunteering, Mazzuca has a passion for sports and the outdoors, especially fishing. He also enjoys photography and dabbles in writing. “Working for Rhinebeck Bank is very important to me due to Rhinebeck Bank’s deep roots in the Hudson Valley”, Mazzuca said. “Being that I grew up locally in Fishkill, here in the Hudson Valley, I feel that working for a bank like Rhinebeck Bank allows me give back to the community that means so much to me.” Mazzuca currently resides in Orange County, and is looking forward to helping the community with their Commercial and Residential banking and lending needs. Rhinebeck Bank is pleased to announce another local artist is now on display in Beacon: Emily Marchesiello. Marchesiello is a graduate of the Masters of Fine Arts program at Queens College CUNY. She is a visual artist who specializes in fine point line drawing, oil painting and watercolor painting. Marchesiello's artwork will be on display in Rhinebeck Bank's Beacon branch from now until March 2nd. Stop in during business hours to take a look. Her artwork can also be viewed online at http://emilymarchesiello.com/. We at Rhinebeck Bank have decided to give a gift to those in need this holiday season. We are the proud presenting sponsor of K104’s Twelve Days of Christmas Wish. Each day for twelve days, K104 will be donating $500 gift cards to local residents going through tough times. Recipients may be struggling due to medical bills, a family tragedy, loss of a job, or any other kind of challenge. What they have in common is that they were nominated for this Christmas gift by thoughtful family, friends and/or coworkers. To nominate someone you know who is going through difficult times this holiday season, email or mail your Christmas Wish letter to K104. Share their story and K104 with Rhinebeck Bank might just brighten their holiday season with some extra holiday cash. Rhinebeck Bank is pleased to announce their most recent artist on display in Rhinebeck: Suzanne Clune. Her abstract paintings will be on display in the Rhinebeck Branch until December 8th. Clune was born in the Hudson Valley to a family of educators. In her early years, her grandmother discovered and nurtured her artistic abilities and talents. This early attention to her artistic side helped lead her to continue honing her skills in college. She received her Bachelor of Fine Arts from Purchase College, and a Masters in Music and Art from Columbia University, then deciding on a career as an operatic soprano. Over time, her paintings have naturally transitioned to larger canvases with a more brilliant palette and greater texture. Her work has been reviewed and chosen by a panel of distinguished jurors to become a member of the National Association of Women Artists Inc. Her paintings can be found in the archives of many art museums such as the Museum of Modern Art, the Guggenheim Museum of Art, the Metropolitan Museum of Art, the Whitney Museum of Art, the Smithsonian, and The Library of Congress. Clune continues to paint in her studio in the Hudson Valley. Scott received his Bachelors of Arts in History from Siena College, and has always had passion for working in a local community. He began his career at Rhinebeck Bank as Branch Manager in Hyde Park in 2012, and is now looking forward to focusing his efforts on helping local families achieve their dream of owning a home. Scott has a strong record of community involvement, formerly working with the Ulster Count Chamber of Commerce, the Kingston Rotary Club, and the Ulster County Board of Realtors. He also, previously lent his mortgage knowledge to RUPCO where he taught “mortgage finance” classes to first-time homebuyers. He is also a former Hudson Valley Young Professional. Currently he serves as the Vice President of the Hyde Park Chamber of Commerce, and as Elder & Deacon of his church. When asked about his new position, Scott said: “As a lender, it is extremely important, and rewarding, to work for a local, community bank such as Rhinebeck Bank. Having local decision-making and local business partners, allows us the opportunity to provide our clients with an excellent home purchase experience.” He emphasizes the importance of building relationships with local business partners in order to provide customers with proper service and the ideal home-buying experience..
March 2017 - Rhinebeck Bank Proud to Announce Two Honorees for the Forty Under 40 Shaker Awards! Poughkeepsie, NY - The Dutchess County Regional Chamber of Commerce’s Forty Under 40 Mover & Shaker Award is an honor that rewards those in our communities who strive everyday to do their absolute best, both personally and within their organizations. Each year a committee (made up of previous nominees) nominates 40 new people to receive this designation. Nominees exemplify dedication not only to their jobs, but to community service, personal improvement and the desire to help others succeed. This year, two of Rhinebeck Bank’s employees have been awarded this distinction; Brandi Rider and Mark Malone. Brandi has been working at Rhinebeck Bank for over 14 years. She began her career as a teller and has worked her way up to her current position as AVP, Business Banking Officer. Her progression through the Bank has given her a wide range of knowledge from retail banking to commercial lending. As AVP, Business Banking Officer, she handles all questions regarding Cash Management products, Remote Deposit, Merchant Services, and, Mobile and Online Banking for her clients. Highly active in the local community, Brandi is on the Board of Directors for Dutchess Outreach and is also chair of their Volunteer Committee. She is a 2014 Leadership Dutchess graduate. Mark joined Rhinebeck Bank in 2012. As the current VP, Area Sales Leader, he oversees the Retail branch team, and is responsible for the Bank’s overall growth, performance and customer service. He is dedicated to helping his employees grow, and is highly adept at assisting business owners secure the financing they need to grow. Mark is also one of the hosts of Wake Up with Rhinebeck Bank, a morning talk-show that helps highlight and promote local business and charities. Also very involved in community service, Mark is the Vice Chair of the Hudson Valley Hospice Foundation’s Board of Trustees, and is Treasurer of the Mill Street Loft Board of Directors. He is also a Leadership Dutchess 2013 Graduate, and a 2014 graduate of the Hudson Valley Pattern for Progress Fellows program. We here at Rhinebeck Bank are very proud of Mark Malone and Brandi Rider. Their continued demonstration of Rhinebeck Bank’s three core values - Local. Involved. Responsive. – is always admired and appreciated. They continue to go above and beyond in every aspect of their lives. October 2016 - Rhinebeck Bank Announces collaboration with Chazen Companies for the Creative Neighborhood in Newburgh, NY! Newburgh, NY – Rhinebeck Bank is supporting the Hudson Valley Pattern for Progress Creative Neighborhood project by providing low cost loans for properties and businesses located in a six‐block radius within the City of Newburgh. Rhinebeck Bank is proud to announce their partnership with The Chazen Companies on this project! Chazen is an employee owned consulting firm and will be providing engineering services to easily assist projects through the redevelopment process. They have been a vested member of the Hudson Valley community for nearly 70 years, and are honored to be a part of the revitalization of the Newburgh area. Chazen's Environmental team has worked on numerous Newburgh properties in various states of disrepair and is dedicated to supporting property transactions and property redevelopment. They are committed to providing support services including Phase I and II Environmental Site Assessments, Transaction Screen Assessments, Pre‐Demolition/Pre‐Renovation Hazardous Building Material Surveys, Building Condition Assessments, planning/zoning assistance, and property boundary surveys. Chazen is excited to be a part of the Creative Neighborhood project and will be offering a discount for their services. Founded nearly 70 years ago, Chazen is dedicated to excellence and is employee-owned, with an accomplished team of over 120 individuals, including more than 50 licensed and certified employees and 20 LEED® Accredited Professionals. Chazen serves a diverse range of clients in both the private and public sectors, including land developers, municipalities, utilities, healthcare and educational institutions, architects and state agencies from its locations in the Hudson Valley, Capital District, North Country and Central New York, and Nashville, Tennessee. For more information, visit www.chazencompanies.com. Poughkeepsie, NY – Brooke O'Connell has taken on a new role as Assistant Vice President, Training and Employee Development Manager at Rhinebeck Bank. Prior to becoming Assistant Vice President Training and Employee Development Manager, O'Connell was a Multi-Site Branch Manager with Rhinebeck Bank starting in November, 2015. O'Connell has also worked as a Branch Manager of Rhinebeck Bank's South Road Branch beginning in April of 2012. O'Connell started her banking career as Branch Manager for Wachovia/Wells Fargo, and as a Residential Lender and Assistant Branch Manager at HSBC. O'Connell graduated with a Bachelor's Degree in Business Management from Marist College and earned her Master's Degree in Public Administration. In addition to her accomplishments in school, O'Connell was given the recognition of being a 2013 Forty Under 40 Honoree. O'Connell said, "Working at Rhinebeck Bank is important to me because we are a locally focused Community Bank that gives each and every employee the opportunity to grow and to have a meaningful impact on our organization and our Community, alike." O'Connell enjoys spending time with her husband Brian, and daughter Maggie. During her free time, she enjoys traveling and reading. O'Connell is also on the Board of Trustees for the Mid-Hudson Children's Museum. Newburgh, NY – The Hudson Valley Pattern for Progress has launched a community development plan with a goal of improving the business climate in an approximate six square block radius within the City of Newburgh. With the intent to increase the impact of one of the City’s anchor projects, SUNY Orange Newburgh, the Creative Neighborhood was defined in a narrow geographic area in order to increase its potential for success. Last night at the Hudson Valley Tech Meet Up, Rhinebeck Bank announced their support of this initiative by establishing a $3,000,000 Loan Fund for the Creative Neighborhood. Rhinebeck Bank will provide business loans through their commercial express loan product, as well as other financing for equipment, vehicle purchases, leasehold improvements, and commercial real estate transactions under preferred pricing structures and terms to the prospective borrowers. Rhinebeck Bank will waive bank fees for these loans and provide a below market rate for the loans, generally at .75% above a treasury rate index, resulting in a 5 year fixed rate at approximately 1.90% based on current rates. "Improving our cities in the Hudson Valley requires a community effort. Rhinebeck Bank is proud to be part of this effort and thanks all other participants for their involvement in this initiative. Newburgh was once a great thriving city – it still has the ability to recapture its past and our intent is to be one part of the effort to restore businesses to the downtown area. Funding is a major factor in community growth and we're proud to provide a source for future business expansion in the city. If you're a business in the Creative Neighborhood area of Newburgh and need funding please call us to explore the possibility of financing with us. Most importantly, our loan officers are ready to provide advice and expertise to help applicants put together their loan application information to be considered for approval under this program." said Michael J. Quinn, President & CEO of Rhinebeck Bank. We at Rhinebeck Bank are committed to supporting the communities we serve. Along with our monetary donations, the volunteer effort by our staff is fantastic - serving on boards of nonprofits, coaching youth sports, participating in fundraising efforts, and even organizing our own fundraising events. During our most recent Community Support Committee meeting, there were several requests to consider. One of the many requests we approved was from the Poughkeepsie High School Yearbook for which we decided to take a ½ page ad. There was a message on the form below the advertising request and easily missed if you weren’t paying attention, that one could also donate $65 to provide a yearbook to a senior who couldn’t otherwise afford one. The Bank also donated one yearbook to support this effort. The next morning I woke up thinking about this request. As I recall my high school years, I can’t remember a single person not having a yearbook. I did not grow up in an affluent area and there were plenty of friends whose families struggled to make ends meet, but as far as I can remember everyone had a yearbook. Back then, yearbooks were a big thing with everyone signing each others’ yearbooks and writing messages about the times we had experienced during our school years. I don’t know if this is still how things are done, but I imagine that it is, and I can’t imagine how I would have felt if I couldn’t participate in this activity. I wrote to the yearbook representative to inquire about the yearbooks. What I found out was not encouraging. The response included the following, “while many students would love a yearbook and all flock to my room when they come in to look at them, many students cannot afford them.” In fact the yearbook only produces 150 copies for a graduating class of over 200 and has sold only a portion of the order in the last few years. Many of us have issues with the current state of our educational system, be it the curriculum, the tax rates, effectiveness of educating for today’s workplace needs, overabundance of districts and many other topics. Certainly, the City of Poughkeepsie School District has its challenges. I believe that the administration is taking steps to address these challenges but I also strongly believe that success will not be lasting until the district has the unequivocal support of the community. The first step in showing support is to demonstrate we care about the children, who are transforming into young adults about to move on with their lives. My wife and I have written a check to provide for an additional 10 yearbooks and after challenging my co-workers at the Bank, they have contributed over 7 more and we are still collecting donations. I would also like to challenge anyone else who is like minded to assist this cause of providing an experience to the graduating class which for my generation was a significant rite of passage. Donations in any amount can be dropped off to any one of the Bank’s locations or sent directly to the yearbook at: Poughkeepsie High School, Attention: Yearbook Club/T. Ward, 70 Forbus Street, Poughkeepsie, NY 12603. Checks should be made payable to “Poughkeepsie High School Yearbook." It may be a small step forward, but we have to start somewhere. Our community depends on it. P.S.- After I had written this letter but before it was sent out, Poughkeepsie and Dutchess County suffered another tragedy in the senseless loss of Caval Haylett. I did not personally know Caval but he was known by some of our staff and their families. I am at a loss of words to comfort those who were part of Caval's life, but I like the rest of our community, feel the loss that should not have occurred on our streets. I don't pretend to have all the answers to changing the environment which fosters such horrible events although I believe it has to start with all of us. All of us finding hundreds or thousands of small acts, like the one above, which show we care about our city and its people. You may think this is naïve, but let's try it and see what happens. December 2014 - Rhinebeck Bank is proud to have once again donated to over 125 local not-for-profit organizations in 2014, Michael J. Quinn, President & CEO of Rhinebeck Bank, announced today. The news comes on the heels of an honor recently bestowed upon the Bank; Dutchess Outreach recognized the philanthropic culture of Rhinebeck Bank this fall at its fortieth anniversary brunch, naming the Bank a “community partner” which has played an instrumental role in moving the organization’s mission forward, according to Brian Riddell, executive director of Dutchess Outreach. “The constant stream of time, talent and financial support that is provided to our organization by the team at Rhinebeck Bank speaks volumes about its commitment to community. Their support of our work has allowed us to enhance the quality of life for countless individuals in this region, and to continue expanding our vision for the future,” stated Riddell. The Bank supports the annual coat drive and food drive for Dutchess Outreach, among other activities, and Brandi Rider, manager of the Red Hook Rhinebeck Bank branch, now serves on the Board of Directors. Dutchess Outreach, however, is just one example of a benefactor of the Bank’s community support initiatives. “Rhinebeck Bank has always believed in supporting our neighbors in the Hudson Valley. We strive to make a positive impact on as many lives as we can by paying it forward through our community outreach program. Our culture is about giving back – not only financially, but through volunteerism as well. Employees here spend many, many hours of company time supporting the good missions of local organizations, and when we look at the funds that have been distributed throughout the year, it makes all of us feel very proud,” says Mark D. Malone, Vice President, Retail Banking at Rhinebeck Bank; who serves on the Board of Trustees for Hudson Valley Hospice Foundation and the Board of Directors for Mill Street Loft. Shemitz, who has served on the Board of Directors at Abilities First, Inc. for over six years, is proud of his employer’s role in the community. “The Bank is a good corporate citizen, and I am really proud to be a part of their good work. Not only does Rhinebeck Bank serve the community by increasing job opportunities and the tax base in our region, but it reinvests in causes that are improving quality of life for neighbors, colleagues and friends. The past six years have been tough on our area not-for-profits – but through solid lending practices and a deep loyalty to social responsibility, we have been able to not only help sustain them, but also to help them achieve exciting new heights,” stated Shemitz. “Being a good corporate neighbor is the cornerstone of our business model at Rhinebeck Bank, and it is incredibly gratifying to know that our contributions to the community are making a difference in the lives of so many around us,” said Malone. For more information, visit https://www.rhinebeckbank.com/AboutUs/CommunityInvolvement. November 2014 - The past decade has unquestionably served up unprecedented economic challenges, but as the saying goes, there is always a silver lining. On the heels of the Great Recession, entrepreneurship is on the rise – and the years ahead are looking brighter than ever for many locals who have launched their own businesses. And, in Malone’s role, he has the opportunity to help these entrepreneurs achieve ongoing growth and development by offering a variety of commercial lending products. Malone and the team at Rhinebeck Bank offer commercial lines of credit, commercial mortgages, commercial term loans and letters of credit. In addition, they frequently partner up with the Small Business Administration to offer start-up and expansion loans for new businesses. For those who have been in business for at least two years, though, there is another lending tool on the table now, which has really helped catapult businesses to a new level of success. That newest option available is the express business loan, unique for its minimal documentation requirements, simple application process and quick turnaround (in some cases, closing in just two business days). The examples of express business loans in action are countless, but Malone spoke enthusiastically about a handful to provide an overview of the cross-section of people with whom he works. A local contractor needed an excavator and a dump truck to secure a particular project, a local marine company was ready for a specialty hydraulic boat trailer, a tree service company requested a loan for a wood chipper, a dentist’s office needed a new chair – and the list goes on. With express business loans providing up to $100,000 for much-needed tangibles, businesses in the Hudson Valley region will continue to thrive. “We are dedicated to serving the business community, and this is the product that they have long been asking for. The express business loans secure financing quickly for businesses who need vehicles and equipment to get the job done, and we are here to make it happen,” Malone shared. “Rhinebeck Bank’s involvement in the community is one of the reasons I came to the Bank two years ago. After spending years at larger financial institutions, I wanted to be part of an organization that focuses on helping small businesses here in the mid-Hudson Valley. Malone is a graduate of SUNY Albany and serves on the Board of Trustees for The Hudson Valley Hospice Foundation and the Board of Directors for Mill Street Loft. He is a 2013 graduate of Leadership Dutchess and a 2014 graduate of the Hudson Valley Patterns for Progress Regional Fellows Program. To learn more about Express Business Loans stop by any Rhinebeck Bank branch office, visit their website or contact Mark Malone directly at MMalone@RhinebeckBank.com. October 2014 - Rhinebeck Bank led the business community as the presenting sponsor of Cocktails at Sunset. This event is hosted by the Rhinebeck Area Chamber of Commerce each year with the objective of raising funds for the white lights that line the streets of Rhinebeck during the winter months. Approximately 150 people attended the dinner-dance event at the Belvedere Mansion on Thursday, October 16th. “This is one of the most highly anticipated events of the year. We are grateful to the Chamber of Commerce Executive Director, Colleen Cruikshank, and the Board of Directors, who work tirelessly to bring us the white lights that illuminate the village of Rhinebeck all winter long. Rhinebeck Bank is proud to support this event and believe our partnership with the Chamber is instrumental in our being a local, involved and responsive corporate leader,” stated Michael Quinn, President and CEO of Rhinebeck Bank. The event sponsorship is part of an active community support program at Rhinebeck Bank; the Bank supports numerous philanthropic initiatives throughout the year, designed to enhance the quality of life for people throughout the Mid-Hudson Valley. “Rhinebeck Bank has been unwavering in its support of the Rhinebeck Area Chamber of Commerce through the years. Their community support program serves as a model for other businesses; we are extremely grateful for their presence and their generosity,” stated Colleen Cruikshank, Executive Director of the Rhinebeck Area Chamber of Commerce. The Rhinebeck Bank parking area on East Market Street will also be home to the official tree lighting celebration on Sunday, November 30th, a tradition that is free of charge and open to the public. There will be numerous activities for children and families to experience that day, and the village lights will have been lit by that point in time. Click here to learn more about the Rhinebeck Bank community support program. October 2014 - October is National Cyber Security Awareness Month! With everything that is going on in the world, it is more important than ever to stay up to date on cyber security and protect your information. Each and every one of us needs to do our part to make sure that our online lives are kept safe and secure. That's what National Cyber Security Month is all about! In order to help you stay up to date, we have developed a short quiz and online resource center of Cyber Security information and tips to help raise awareness. Take the quiz now! April 2014 - We are happy to announce that effective April 27th we are instituting several enhancements to our online banking service. Now, you can download transactions from multiple accounts, access both internal and external transfers all on one screen and make late and/or additional payments towards principal on one screen. Click the link to access our online instructional booklet. April 2014 - As you may already be aware, information about an internet security flaw called Heartbleed has been circulating in recent days. Hackers have been using this exploit to gain access to individual password information and other personal data. We would like to assure you that Rhinebeck Bank is working closely with our technology partners to ensure that your passwords and personal information remain secure, and, to the best of our knowledge, Rhinebeck Bank's website, online banking service, and other affiliated programs are not affected by Heartbleed. With this information coming to light however, users of other external sites may be affected and their passwords may be compromised, therefore, if you use the same or similar passwords for many different accounts online, now may be a good time to change your password to keep yourself safe. December 2013 - We are aware of fraudulent phone calls made to consumers claiming that their debit card has been suspended. These calls are generic and do not mention a specific bank by name. 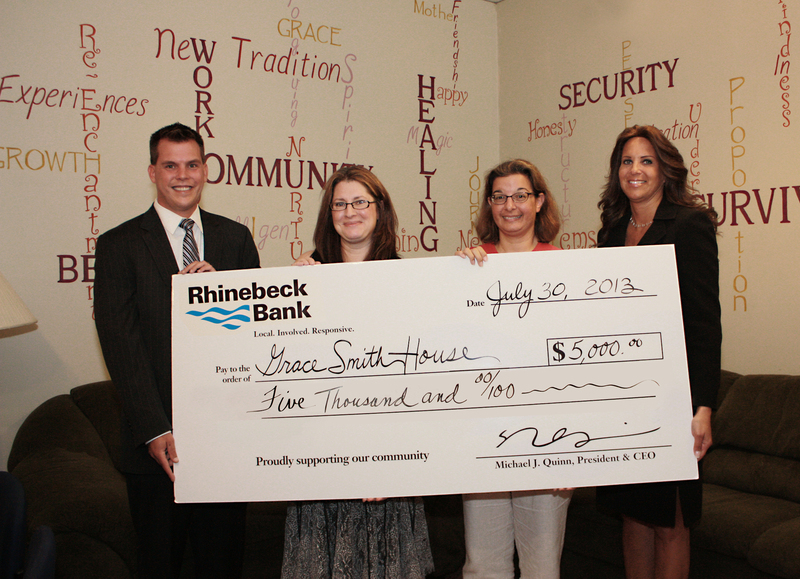 August 2013 - Grace Smith House, a local nonprofit organization that supports women and children exposed to domestic violence, is happy to announce that Rhinebeck Bank presented a $5,000 donation to the Kitchen Renovation Project. On a recent visit to the Grace Smith House domestic violence shelter program, representatives from Rhinebeck Bank were struck by the condition of our failing kitchen and inspired to assist us with renovations. The importance of this project cannot be overstated. Unfortunately, the kitchen is a place where many incidents of domestic violence occur. For many this room has become a place associated with violence and harm. In our shelter the kitchen is also a very important location for the healing process to begin and prosper. Women in our shelter come together with each other and their children while they prepare communal meals, and a more pleasant environment would stimulate more conversation, which leads to personal growth. “We found this project to be a meaningful way for us to help make a difference at the Grace Smith House”, stated Jamie Bloom, SVP of Retail Banking with the Bank. Grace Smith House has been providing a safe haven for women and children who are survivors of domestic violence since 1981. Grace Smith House offers crisis intervention, protection, Latina outreach, room and board, counseling, advocacy, children’s services, support groups and more. To learn more about the agency, visit www.gracesmithhouse.org. The staff of Grace Smith House works with the families who are currently in the program on developing positive, productive, non-violent interactions focused on establishing a new definition of family after the terrors domestic violence. August 2013- The public is once again invited to meet 17 talented artists and step into their private (and some hidden) studios over Labor Day Weekend: Saturday, August 31st and Sunday, September 1st from 11 a.m. to 5 p.m. Using the brochure/tour map, available at many venues in the Hudson Valley or online at www.artstudioviews.com, visitors can easily navigate the Route 9 and 9G corridors from Tivoli, through Red Hook, Rhinebeck and Hyde Park. Art adventurers can preview the artists’ work on the website and conveniently plan their stops using a GPS and the online map. Bright yellow signs along the route will guide you to their studios, where they will be waiting to meet you and reveal a few creative secrets. Demonstrations, hands-on creation of art pieces, how-to sessions, and art videos are highlights of the event at some studios. Enroute to those hidden studios, enjoy the glorious Hudson Valley countryside: cows, cattle, sheep, farmlands and farm stands all make for an enjoyable weekend. Brochures will be available at the three local ASV headquarters along Route 9, anchoring the tour area from the northern gateway in Red Hook down to Hyde Park, the southern gateway: Red Hook Community Arts Network & Artists’ Collective (www.rhcan.com), the Betsy Jacaruso Studio & Gallery in Rhinebeck (www.betsyjacarusostudio.com), and the Artists’ Collective of Hyde Park (www.hydeparkartists.com). These are all well-known, established galleries started by artists who have participated in Art Studio Views tours. In addition to stopping for information at the galleries during their open hours, you will have a bonus experience of seeing the current exhibit at each. Another opportunity to meet the artists and view their art will be the Art Studio Views Kickoff Party on Thursday, August 15th from 5:30-7 p.m., generously hosted by The Rhinebeck Bank at its 6414 Montgomery Street branch in Rhinebeck. Rhinebeck Bank, the Presenting Sponsor for all six years of the Tour, is known for its support of the arts and a strong belief that by doing so it helps to strengthen the economic well being of the communities it serves. The exhibit of the Art Studio View artists is on display in the Rhinebeck Bank Atrium Gallery until the end of September. Doris Cultraro, Art Studio Views co-founder and member, is coordinating this year’s tour, including her own stained glass studio (www.dcstudiosllc.com). With almost 40 years of experience in the art of stained glass, Doris explains her viewpoint of what the tour has to offer to the participating artist and their guests. “Visitors can start a relationship with the artists that will last a lifetime. Purchasing art directly from the artist is very personal, and will open up new ways of appreciating the art they buy once they experience what goes into making their masterpiece. When purchasing art for oneself or to commemorate a special life event - by choosing to give a work of art, a bond is created with the artist. We hope that relationship continues. It’s very personal and rewarding, with a story that will endure over time. Everyone needs art in their lives and will seek it out. With Art Studio Views, the visitors have the opportunity to get to know the artists and their work in a more relaxed and inviting environment. They will acquire a better understanding of what is behind the original masterpieces created in the studio environment. Best of all, our brochure and website contain the list of artists who are available year-round to meet their art needs, to continue the ‘Art Conversation’, and to create something truly unique for their new clients. View art, acquire art, become a collector and a friend of the artists this Labor Day weekend during Art Studio Views in the Hudson Valley.” Website: for artist information and downloadable brochure and map: www.artstudioviews.com. July 2013 – Michael J. Quinn, President and CEO of Rhinebeck Bank, is proud to announce the appointment of Richard J. Kolosky to the position of Senior Vice President Commercial Lending. In his new position, Kolosky is responsible for overseeing the Commercial Lending division of the Bank. A 20-year veteran of the banking industry, Kolosky has extensive experience in business development, commercial loans, credit analysis, loan and asset/liability review and financial analysis. Prior to joining Rhinebeck Bank, Kolosky held senior management positions at local banks. With a deep commitment to customer service, Kolosky is pleased to be part of the Rhinebeck Bank team. “I am delighted to be working at Rhinebeck Bank. The Bank’s long-standing commitment to the communities in which it does business means a lot to me” says Kolosky. Kolosky holds a Bachelor of Science degree from SUNY Cortland and a MBA from Pace University. Kolosky resides in Fishkill with his wife and has three children. Richard is involved The Foundation for Vassar Brothers Medical Center; co-chaired the Center for Ambulatory Surgery Capital Campaign; is a past officer of the Dutchess Regional Chamber of Commerce as well as the Greater Southern Dutchess Chamber of Commerce and has participated on numerous committees for both chambers. June 2013- Rhinebeck Bank is proud to hang the photographic works of Matthew Roger at their Rhinebeck Branch Atrium Gallery. The show is available for viewing until mid-July. Roger, a native of Hyde Park, has taken his love of the Hudson Valley and expressed it through the lens of the camera. Matthew picked up a camera back in high school and hasn’t put it down since. After graduating from SUNY Purchase with a BFA in Fine Art Photography, he returned to the area and launched his professional career. Matthew’s work includes a wide range of panoramic, landscape, nature, and black and white images. Rhinebeck Bank branch hours are Monday – Friday 8:00 am until 5:00 pm and Saturday, 8:30 am until 12:30 pm. May 2013- Michael J. Quinn, President and CEO, is pleased to announce the recent addition of Andrew V. Trivero Jr. as Branch Manager of the Fishkill Branch and Michael J. Liguori as Branch Manager of the Beacon Area Branch. Andrew brings nine years of banking experience to Rhinebeck Bank and previously held the position of Senior Branch Manager at another financial institution. He is currently involved with the Exchange Club of Southern Dutchess, the Dutchess County Regional Chamber of Commerce, Relay for Life and Leadership Dutchess. Michael has six years experience as a Branch Manager at other financial institutions and was previously an insurance agent before entering the banking industry. He is a 2012 graduate of Dutchess Regional Chamber of Commerce Leadership Dutchess. Michael strives to know all his clients, giving him the opportunity to provide appropriate solutions to help them reach their financial goals. April 2013– The eighth grade students at the Dutchess Day School will be exhibiting 13 self-portrait paintings at the Rhinebeck Bank Atrium Gallery located in Rhinebeck, NY. The exhibit will be on display from April 13 through May 31, 2013 as part of the school’s Community Arts Outreach program. The self-portrait project, titled “Self Reflection,” is an inter-disciplinary endeavor originating in both art and English classes. Through writing and drawing exercises, before beginning the paintings, each student intensively examined his or her personality, style, and appearance, with a focus on examining what it means ‘to be me’. By looking at themselves through a positive, creative lens, minimizing self-criticism and maximizing self-celebration, they created beautiful portraits to express themselves through color, texture, light and shade. Each painting is as unique as its subject, and depicts both persona and appearance. Students worked from photographs, but had the freedom to alter the image as desired. Dutchess Day School is a pre-kindergarten through eighth grade independent school located in Millbrook, New York. With its rigorous academics, competitive athletics and innovative arts programs, DDS provides hands-on instruction from an experienced faculty who make learning fun. For more information on the Community Arts Outreach program, contact Alison Roland at (845) 677-5014 or roland@dutchessday.org.